Dodd is a familiar sight from the Keswick area, from where it appears as a shapely pyramid sitting between the Skiddaw range and Bassenthwaite Lake. 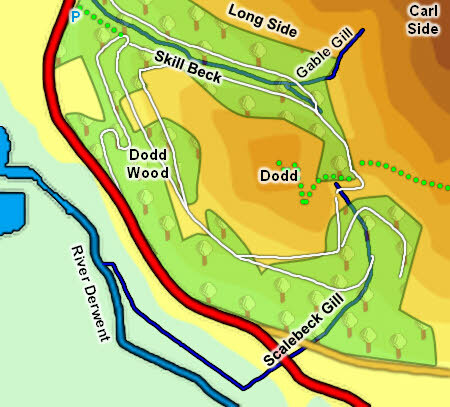 The bottom part of the fell is forested, and a series of attractive walks head through Dodd Wood, all starting from the Forestry Commission car park near Mirehouse. From the west Dodd appears as the first of three 'steps' that lead up to Skiddaw, with Dodd first, then Carl Side and finally Skiddaw at the top. This effect is best seen from Barf, where the three fells are almost lined up. The summit of Dodd is a superb viewpoint, with excellent views of Bassenthwaite and Derwent Water, and a view south into the heart of the Lake District. The Newlands fells are also seen to good effect. Dodd is a great example of how well the modern Forestry Commission manages its woods, with the top of the fell now clear of conifers and some lovely way marked paths through the forest. The valley of Skill Beck is a particular favourite, with a good mix of trees. Dodd is surrounded by a network of forestry tracks. The easiest way to the top is to follow either of the tracks that run alongside Skill Beck. These reach Long Doors, the pass between Dodd and Carl Side. Just before the top of the pass a path branches off to the right, then curves around the southern side of the fell before eventually turning into a footpath that climbs up the open fellside to the summit. We currently have no walks on Dodd, but the instructions above will get you to the top. In Wainwright's day the summit was covered with trees, but the top part of the fell has now been cleared. The fell rises to a neat little summit, with great views in every direction, and topped with an impressive memorial. The River Derwent runs along the western foot of Dodd. The eastern border is formed by Scalebeck Gill, which runs south and joins the Derwent. The northern border is formed by Skill Beck, which runs down a lovely wooded valley to reach the Forestry Commission car park for Dodd Wood then flows north-west past Mirehouse before reaching Bassenthwaite Lake. Dodd has no tarns, but it does have a sizable footing on Bassenthwaite, running for nearly a mile between the points where the Derwent and Skill Beck flow into the lake. Dodd is the base of the Lake District Osprey project. The birds themselves have nested in several places in the area, starting o the far side of Bassenthwaite, before moving onto Dodd for a few seasons. In 2013 they were in the valley bottom, just within range of the viewing platform on Dodd. When the birds are present the RSPB has a viewing station on Dodd, with high quality telescopes looking towards the nest (and experts to correct your aim!). This is also a great place to see Red Squirrels as they come to the feeding stations below the viewpoint.